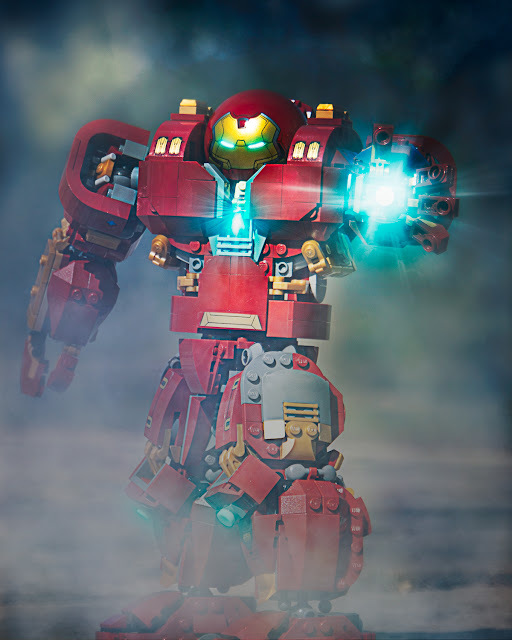 A few weeks ago I got the chance to review the LEGO Hulkbuster: Ultron Edition set over on the Toy Photographers blog. To support the review I created several shots with the Hulkbuster. Here is a peak behind the curtain of how I processed one of the shots from that review in Photoshop. Its not super detailed as that would take way too long (there are 21 layers to this shot), but should give a bit of an insight into the process of taking a photo from in-camera to a finished shot in my world. Hopefully by the end experienced Photoshopers will know how I did it, and newer folks will have a starting place to start looking up tutorials online on how to accomplish each step. The next step was to clean up the image by using the healing brush to clean up dust spots. I then selectively sharpened the head and chest of the Hulkbuster with a high-pass filter on its own layer with the overlay blend mode, and a layer mask. 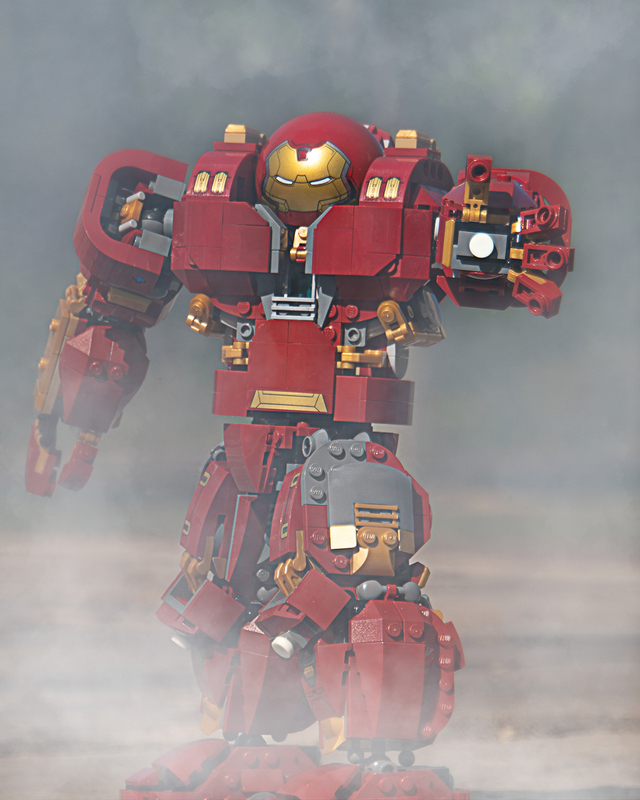 Then I added some more smoke to the image. Using a white soft brush with low opacity and flow, and some creative blur filters on two layers. One to add smoke to the background, and another layer for the foreground. 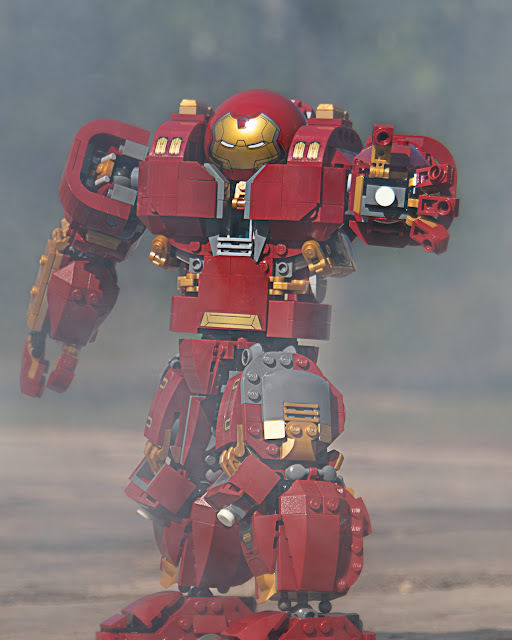 It gives Hulkbuster more of a sense of place. Next comes the first of the special effects, which was to add the blue glow of the repulsor in the left hand. 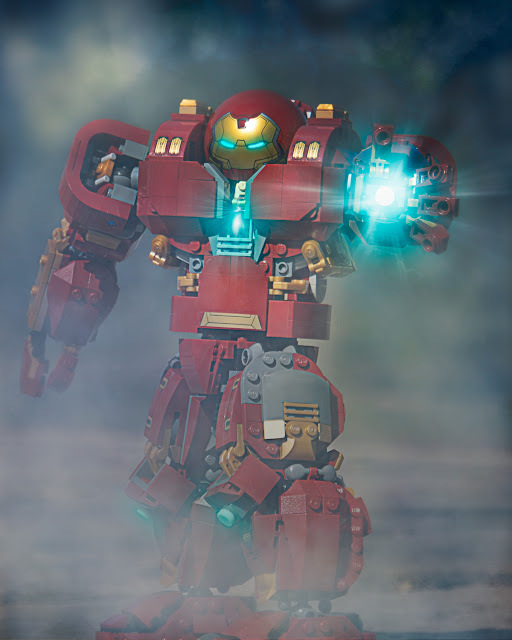 I used a really soft brush on low opacity to slowly build up the lights. It took 3 layers. One for the while light, one for a general blue glow, and one for the light rays. Putting them on their own separate layers allows me to adjust east part of the light without affecting the others, a real time saver. The rays were created using the radial blur filter. This is the trickiest technique and the hardest to explain in text, so If anyone is really interested I can do a separate tutorial on just that process. 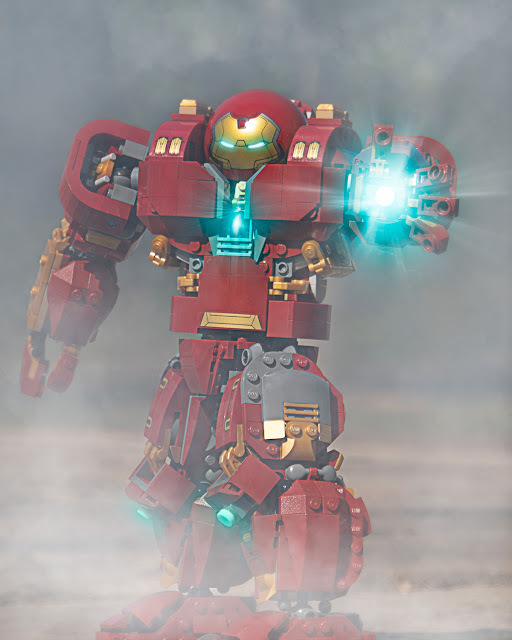 The chest glow was done on their own separate techniques, but using the same basic techniques as the hand repulsor. The eyes were done in a similar manner, except more basic - just a layer for the blue, then a layer for the white. I painted the white in using a harder brush at 100% opacity, the used a slight Gaussian blur to let it fade from white to blue. I also added really basic glow to the knee repulsors with a simple soft blue brush with a transparent opacity. Now that the basic structure of the image is there, time to dodge and burn. My dodge and burn technique is to create a new layer set to overlay blend mode, then use soft white or black brushes with low opacity and flow. I slowly brushed over things, building up the burns until I got the look I wanted. This process helps selectively lighten and darken areas, and increases saturation. Finally I used a couple brightness/contrast layers with some layer masks to brighten up the center and darkening the outside. Basically a vignette around the edges, and brightening the center to make the lights pop. So thats how it's done. Pretty simple over all. The secret is in knowing some basic image theory, and slowly building up using layers, brushes, and blend modes to make the image pop. If you want more information, pop the question into the comments below and I'll do my best to answer. If you want me to do this with any other images, let me know that as well!